Welcome to the Southeast Michigan Officials Homepage. 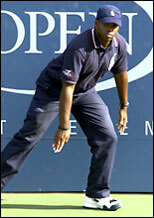 In an effort to ensure fair play, we require certified officials at all USTA Sanctioned Events. If you have an interest in becoming a USTA Certified Official, please see appropriate categories for testing certification. Our current Chair of Officials is Shiraz Bhagwagar.